My friend Christina’s daughter Ella is turning 4 soon. 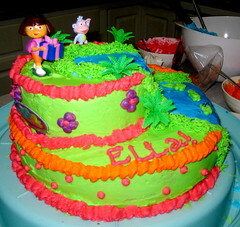 And Christina was looking at Dora cakes for Ella’s party. She found this one that she liked. But custom cakes can be pricey. I looked at it and thought, maybe I could do that. So this afternoon Christina baked up the cakes and I went to her house to decorate them. 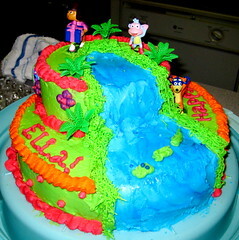 I haven’t made a cake like this in years, and I need some more practice before Ella’s birthday and the real cake, but it’s not too shabby I think. 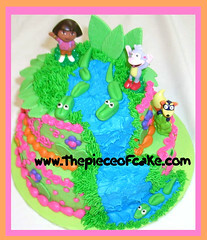 width=”240″ height=”223″ alt=”First attempt at Dora cake” /> The colors of my cake aren’t as bold as they seem to be in the photograph. And we skipped the big leaves in favor of the little palm trees. 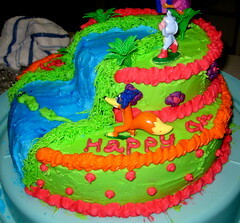 The real cake will be on a cake board that will continue the river into a pond with more gators. I better whip up some icing for practice!